These were very sage words from a twenty-seven-year-old Indian who came of age in the turbulent world of the United States Southwest in the last quarter of the nineteenth century. His true name remains unknown; he was called Kid by the military personnel at San Carlos Reservation in the southern Arizona Territory where he served with the US Army as an Indian scout intermittently from 1882-87. He became known as Apache Kid only after he was court-martialed on charges of desertion and mutiny following a skirmish at the reservation when he and four other scouts attempted to turn themselves in after being absent without leave for five days. 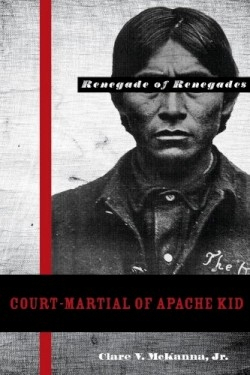 It is McKanna’s thesis that Kid was caught between cultural loyalty to his Apache heritage and the flux of ever-changing military and civilian laws. McKanna, who teaches history at San Diego State University, is the author of several other books on Native American history. His fascination with military law is also evident in the detail he presents in dissecting the Kids court-martial trial. Several historical figures are prominent in this story, including General George Crook, considered the army’s greatest Indian fighter, and Geronimo, whom the Kid actually helped track and subdue. The most interesting sections are those where McKanna details the history of the Native Americans at this time, including rituals adolescent males followed to become physically toughened: “Apache boys were sometimes required to run with a mouthful of water to train them to breathe through the nose.” The evolving role of the Indian Scouts is also quite interesting: “To distinguish themselves from the hostile Apaches, they wore red bands around their heads” during confrontations. Because the main focus is on the actual trial, military law history is included. What could otherwise be quite dry information is interspersed with biographical bits on some of the leading participants. A timeline of events and an index of the names of those involved might have been helpful to readers.